Where to eat Chinese noodles in the East Bay. Bert Johnson The namesake dish at Classic Guilin Rice Noodles. The concept behind Noodles Fresh (10042 San Pablo Ave., El Cerrito), a new restaurant that I write about in this week's dining review, is to serve famous noodle dishes from all over China: Guangxi to the south, Beijing to the north, and Yunnan to the west. While some of the dishes were quite good, my meals at Noodles Fresh — the only place in the East Bay that serves Jiangxi rice noodles — also made me appreciate just how good we East Bay noodle lovers have it in terms of regional Chinese specialties. Here's a list of where to go to find the best of the best. Let's start with the most rarefied of noodle-slingers — a restaurant that is (now along with Noodles Fresh) one of the only places in the whole country that serves the Guangxi province's most famous specialty: Guilin rice noodles. 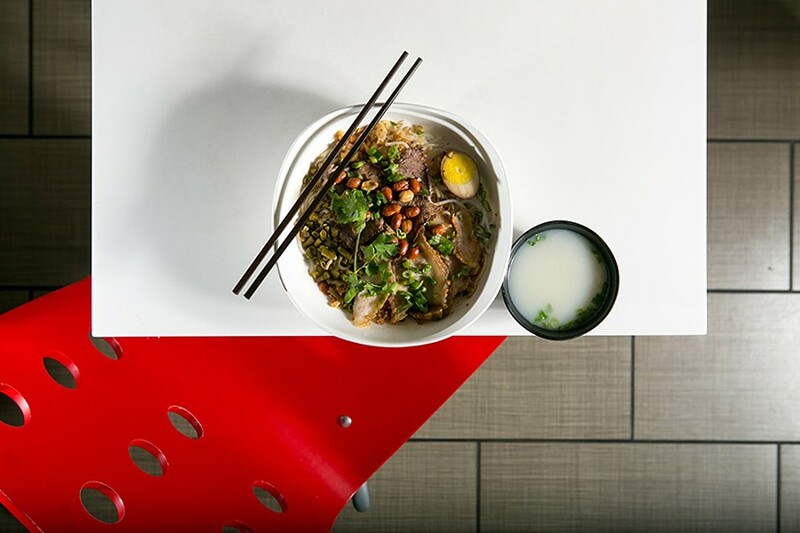 Located in Oakland Chinatown, Classic Guilin Rice Noodles (261 10th St., Oakland) not only serves a destination-worthy version of its namesake dish, the restaurant also offers a number of other intriguing, and hard-to-find, noodle dishes that are unique to Guangxi. Gary Stevens — aka "Gary Soup," a San Francisco-based blogger who writes about Asian noodle dishes in the Bay Area on his website Full Noodle Frontity — is particularly fond of the hot-and-sour noodle soup known as lao you fen, or "old friend noodles." In a direct message on Twitter, Stevens told me, "I liked the lao you fen for the broth's combination of marked spiciness with sourness from sour bamboo, and the sturdy wide rice noodles that rivaled wheat noodles for robustness." I wish more Chinese restaurants in the East Bay would specialize in fresh handmade noodles, which, with their hearty flavor and toothsome texture, are my platonic ideal when it comes to Chinese noodles. Thank God, then, for Shan Dong Restaurant (328 10th St., Oakland), the Chinatown standby that has been satisfying customers' fresh-noodle cravings for years. The menu has dozens of noodle dishes, but no matter which one you pick, the key is to request the "knife-cut" noodles, which are made fresh in-house, and are appealingly uneven and rustic in shape, and as thick and chewy as you could hope for. I especially love these knife-cut noodles in the house spicy chow mein — something about how the fiery chili-infused oil adheres to each plump noodle strand. Great China (2190 Bancroft Way, Berkeley) is better known for its Peking duck and luxurious seafood dishes than for its noodles, with one notable exception: the very unusual, and extraordinarily delicious, cold noodle salad known as liang zhang pi, aka "double skin." The base of this refreshing salad consists of translucent sheets of mung bean noodle that get tossed at the table with egg, shrimp, pork, sea cucumber, wood-ear mushrooms, slivers of assorted raw vegetables, and — most crucial — a kind of "dressing" made by mixing soy sauce and hot mustard powder. It's an addictive mix of contrasts: warm and cool, crunchy and soft, savory and sinus-clearingly spicy. We can debate whether Dragon Gate (300 Broadway, Oakland), a Taiwanese restaurant, ought to be included in a roundup of regional Chinese dishes, given Taiwan's status as an autonomously ruled island nation. What isn't up for debate, however, is the deliciousness of Dragon Gate's rendition of Taiwan's national dish: Taiwanese beef noodle soup. I love everything about this dish: the low-burning, fermented-bean-paste heat of the beef broth; the tenderness and gelatinous richness of the slow-cooked beef shank and tendon; the chewiness and infinite slurpability of the noodles themselves. Pickled mustard greens add just the right tangy counterpoint to the hearty, spicy soup.